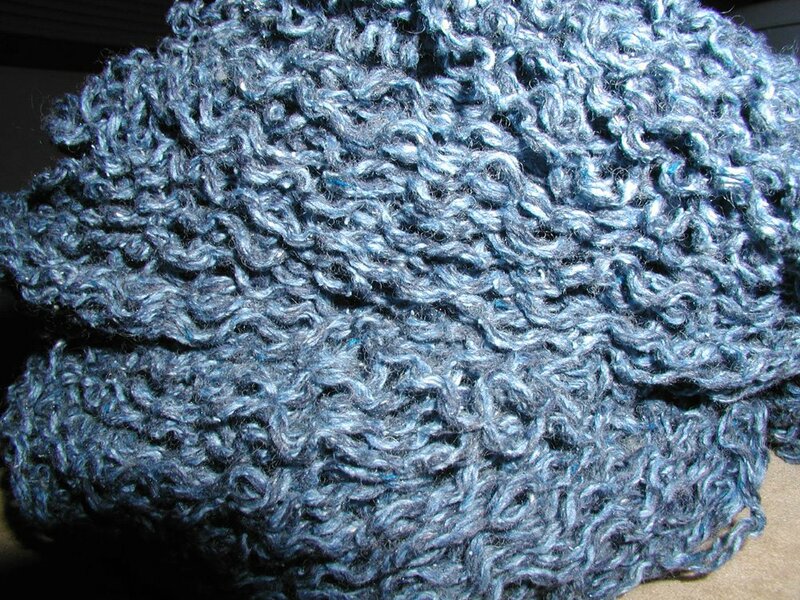 It seems like a decent amount of yarn although I really have no way of estimating yardage. If you can see the thing in the upper right corner that is the turtleneck part I left whole to give you an idea what the sweater looked like before it felt my wrath. I rung it out by hand, rolled it in a towel (twice). I figure it will take a day or two. Then I can wind it up with my trusty ballwinder (oh how I love thee). 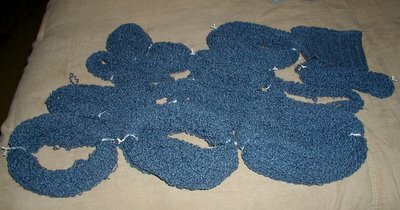 If I were to estimate the weight of this yarn I would say its probably a sport/DK weight. I'll have to swatch some of it when it's all said and done. 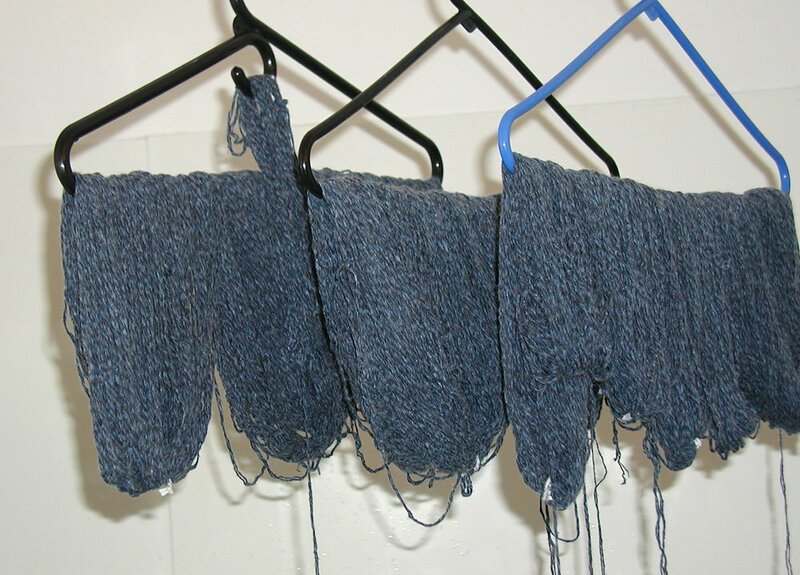 But I can tell by looking at it that it's not worsted weight. Oh here's a close up of the fiber in its kinked-up, perfumed, dirty glory. Oohh... baby, baby! Still no Winter IK issue. I plan on using that Customer Service # they gave me in reply email. In the meantime, I casted on for sock 1 of Rapunzel Sock (the snobby cousin of Traveler Sock). I'm using woolease (of course) in gray. I bought the skein for a buck-fiddy at the Joann's in the mall that I don't like going to. Thankfully they're going out of business and all there yarn was 30% off plus I got to use my coupon. I might have splurged more but there wasn't any other yarn or colors that appealed to me. Although, they have tons of fuzzy and ribbon-like novelty yarn if you're into that sort of thing. Cheers! Boy, that Jo-Ann's has needed closing for a long time! When I came back to Syracuse for the holidays, I was reminded how disarrayed it always was. I got to visit the newer one out in Fayetteville - it was like a WalMart with nothing but crafts! Much better to shop at. Now I just need the company to do something about the Jo-Ann's here in New Hampshire. The one by me is so bad, I have actively wished for the chain to go bankrupt so we could get someone else in. Since seeing the one in Fayetteville, though, I just want them to decide that it's worth putting a good Jo-Ann's here! Damn those IK people! You'd think you'd have your issue by now! Awesome find with that recycled sweater. I don't know how patient I'd be waiting for it to dry, so far it seems you're doing pretty well. You'll be able to make something really nice with that yarn- I love the color. Thanks for the deconstruction link- I'll file that away for future reference!